It’s all hands on deck for the Public Lighting Department as the countdown to the Festival of Lights begins. It is their job to fit the lighting gels to the city centre street lights to create a particular colour effect. The Festival of Lights is sooner than you think. Three months before the big day, we are giving you a sneak preview of the festival programme. The public contract for the artistic programme for the light installation in the place des Terreaux is now on line. Take part in the 2018 Festival of Lights artistic programme! Due to strong winds, some attractions will not be on open on Sunday evening. FRANCE 3 Trophy of Lights, vote for your favorite creation. Vote for your favorite sustainable creation. 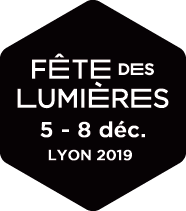 On December 7 at 7:30 p.m., 30 minutes on the dot before “Enoha fait son cinéma”, the light installation on Place des Terreaux, opens to the public, the bells of the City Hall carillon will chime to announce the opening of the Festival.